Learn how to create, organize, duplicate, rename, delete and restore templates. To begin, click on the big green button "+Create New Template" at the top of the page. To select a template, simply click on it and it will open a larger view of it. You can then click the green button at the top that says "EDIT THIS THEME", which will take you to the editor view. All of the templates already have the essential elements you need to apply it on a listing. Which include the Product Title, Product Description and an image Gallery. The great thing about these elements is that they are dynamic placeholders and therefore will show information according to the listing you apply the template to - they do not need to be edited on the template. Once you are satisfied with how the template looks, make sure to have a quick glimpse at the Mobile View to see if it needs to be re-arranged. You can change it to the mobile view by clicking on "Desktop View" at the top of the page and switching to the Mobile View. "Home" is your main templates folder. "🗑 Trash" is where deleted folders will be moved to. If you wish to organize templates in folders (eg. per category or eBay store), you can create a new folder by clicking the "+ NEW FOLDER" button, entering a name for the new folder in the pop-up window, and clicking "SAVE". The new folder will appear on the left-side menu. Click on the small check box to the left of the template name to select it. Click the "MOVE TO ⯆" button from the menu that appears above. Select the folder name from the drop down list. Click the "MAKE A COPY" button from the menu that appears above. Type a name for the new template copy, and click "SAVE"
Tip: It's a good idea to make copies of your main template for backup if you plan to make any changes. That way, you can always go back to the original version should you need to. Click the "RENAME" button from the menu that appears above. Change the name in the text box, and click "SAVE". Deleting a template will remove the template from your folders, and into the trash. Click the "DELETE" button from the menu that appears above. The template will disappear from the folder, as it is moved to "Trash". If you click "Trash" on the left side of the page, you will see the template there. The great thing about the "Trash" folder is that if you made a mistake, you can always restore the template. Note: If you wish to permanently delete a template, make sure to enter the "Trash" folder, and follow the same steps above. Deleting a template from the "Trash" folder will permanently delete it from your account. 6) Restore a template from "Trash"
Click on the "Trash" folder from the left-side panel. Now select a template by clicking on the small check box next to it. In the menu that appears above, click on "RESTORE FROM TRASH". The restored templates will appear in the "Home" folder which can be accessed from the left-side panel of the page. 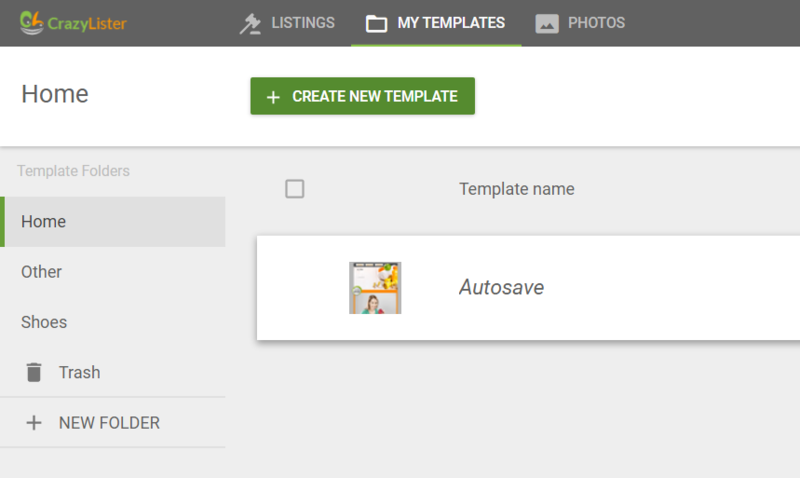 At the top of the templates list under the "Home" folder, you will find the "autosave" template. This template is a backup of the last template you were working on. It's important to note that since this is a backup feature, it should not be used as your main template. Always save your work under a unique name. If your browser or computer shut down or if you lost your work session for any reason, the autosave is where you'd like to go to. You can make a copy of the autosave and save it under a unique name to continue from where you left off.